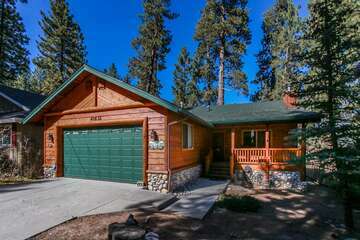 Choose Big Bear for an anniversary vacation that will produce an eternity of memories. The gorgeous backdrop of the San Bernardino Mountains juxtaposing with Big Bear Lake makes it one of the most unique landscapes in America. Drift away into a night of relaxation and mystique while staying in one of our romantic cabins in Big Bear. First, enjoy a romantic dinner at one of these wonderful restaurants for an anniversary celebration in Big Bear. Peppercorn Grille is a local favorite partly because its’ co-owner Julie Hastings was born and raised in Big Bear. But the reputation of Peppercorn Grille is mostly upheld with all of the delicious food they’re cooking up. The Grille’s dining room has several private booths, perfect for a romantic lunch or dinner. There are also tables with beautiful views of the Village. The heated patio is a popular place to grab a drink and watch the foot traffic of Big Bear walk by. The food menu is sure to please, offering everything from soup and salad to filet mignon steak. Grizzly Manor Café isn’t meant to feed to the bears in Southern California, but you might think that judging by the portions served here. There’s no excuse to leave a meal hungry when you sit down for what is “the best breakfast in Big Bear” according to a few locals. The Fat Plate is true to its name, and two people will likely struggle to finish all the food. Try not to drool too much as your fluffy, steaming hot pancakes come to your table desperately trying to escape the plate that barely holds them. Dig in. 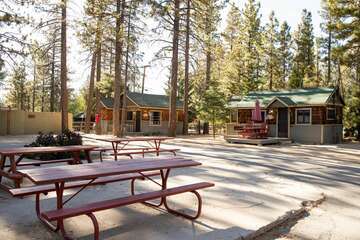 The Captain Anchorage Restaurant has been a staple in the Big Bear Lake community since its’ opening in 1974. The restaurant was originally known as the Sportsman’s Tavern, but visitors of yesteryear can expect the same quality of seafood. Captain’s Anchorage is even home to a friendly ghost named “George”. His rattling of pots, or his hiding of silverware does not deter employees. The restaurant staff can tell you tales of his times as the Sportsman’s accountant, and how he came to “haunt” the location. George won’t start eating into your seafood, steak or pasta – but he may implore you to order a delicious dessert for him. 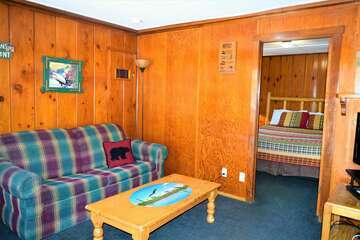 Relax and rest after a fun day enjoying everything Big Bear has to offer at the perfect vacation rentals. Contact our team and allow us to help you find the ideal setting for your vacation!